So championed Meichelle Arntz, founder of Angels Foster Care of Santa Barbara This extraordinary organization cares for neglected babies by placing them in loving homes in the county. A fundraising luncheon, “Al Fresco Afternoon the Riviera,” took place in the gardens of the Four Seasons Resort The Biltmore Santa Barbara to support the program. Guests, including Alixe Mattingly, Roxie Solakian and Susan Pitcher, were fascinated to learn about the research showing how sensitive babies are to changes in caregivers. Babies need consistent, dependable nurturing for neuro-psych development. Without it, their brains cannot develop in the areas needed for bonding and attachment- the very elements required for building empathy, trust and conscience. And without those, evidence is clear: Violent behavior towards self or others is fundamentally linked to the lack of healthy bonding in the first few years of life. This is precisely what happens to too many children in county foster care. Ms. Arntz's concern about foster babies began when working as a Court Appointed Special Advocate. She was assigned two brothers, ages 2 and 5, who had been moved six times within 12 months through foster homes and shelters. Not surprisingly, they later suffered from severe attachment disorder. Ms. Arntz started Angels Foster Care to focus on children under age 2 because bonding is learned behavior and needs to be imprinted within the first two years of life. 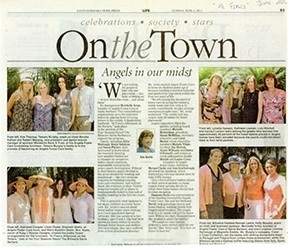 Angels supporters filled the garden, including board members Michelle Richardson, president, Susan McMillan, secretary-treasurer, and Carol Brown; event committee members Michele White, co-chair, Sue Bickett, Annie Williams and Dawn O’Donnell; and honorary event ambassadors Leslie Haight and Louise Casey. A number of Angels foster moms, including Margot Clarke and Ann Scarborough, attended the luncheon, which featured an informal fashion show by Saks Fifth Avenue. Only a third of foster babies return to their natural parents, so many Angels parents decide to adopt their foster babies should that become an option. Shannon Neels was representative of the families licensed for Angels Foster Care. She and her husband, David, took parenting classes and home studies. Working closely with Angels social workers, the couple took in a 21-month-old girl for foster care. Within two days, Shannon knew she wanted to adopt the toddler.